Politics in the age of new media have different characteristics than the politics before the year 2000. Since its launch, the World Wide Web revealed itself as a powerful tool to reach a large part of the (wealthy) population. The Pew Institute reported that more than 55 percent of the adult population in the United States got their news and information, and took part in political dialogue in the 2008 presidential elections, through the Internet. It must not come as a surprise that the use of Internet turned out to be an important factor in Obama’s successful campaign in that year. Wattal et al researched the role of the Internet in the United States election process. They noticed a migration from place to space, when comparing the President Truman’s 1948 whistle stop tour with the Obama “Get Involved”/”Yes we can” campaign. 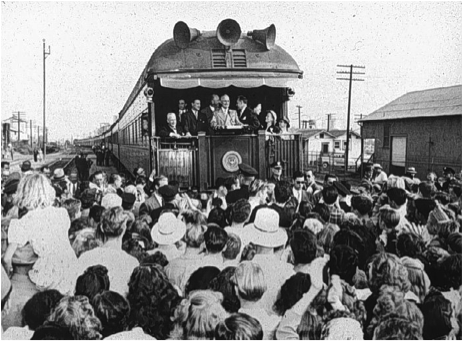 President Truman travelled 21.928 miles in four months, a journey which helped him to win the election. “Traditional election politics featured oration and speech making at rallies, the handshake, fundraising dinners, billboards, TV ads, and campaign offices in small retail storefronts.” (Wattal et al, 2010). Still it is likely that President Obama reached more people, and not only within the US, but all around the world. E-politics focuses on websites, blogs and social networks to spread their word and win voters. The physical neighbourhoods where Truman had to make the same speech over and over again changed into digital neighbourhoods where one copy of a speech can be viewed and shared as many times as you want by as many people as possible. E-politics change politics as we know it, and raise new problems and opportunities. Questions about the nature of competition, information distribution, replication mechanisms and the change of politician and citizen relationships are being raised. Obama mentioned in a speech in 2008 that ordinary people are being empowered politically and this breaks down the power of institutions, which is a healthy development. 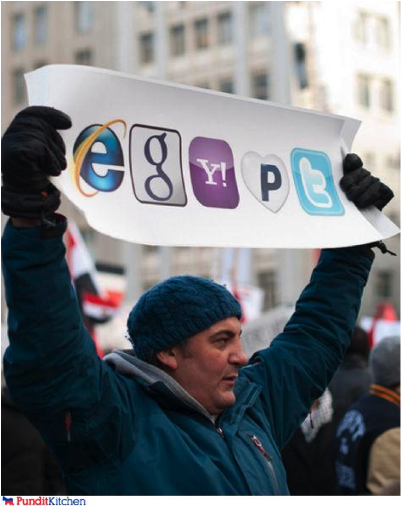 (YouTube, 2008) This expresses itself in the Internet revolution in Arabic countries at the end of 2010 and first months of 2011. The smoky salons and café’s in which people spoke about the changes that had to be made in their countries were traded for a digital environment. (Martinez, Volkskrant 8 february 2011) With the use of Facebook and Twitter, the salon changed into a public discussion area where people can enter the political debates with one click of their mouse. These debates were the beginnings of the revolutions with as result the resigning of the suppressing leaders Hosni Moebarak in Egypts and Muammar Gaddafi in Libya. “Proponents of the democratization thesis (e.g., Barber 1998) see the Internet’s interactive potential as transformational, while proponents of the normalization thesis (Davis 1999; Margolis and Resnick 2000) or the institutional adaptation model (Chadwick 2006) foresee no Internet induced change in the fundamental political inequalities of the present system.” (Wattal et al, 2010). Since the debate about whether the online discourse of political parties and politicians influences the voting behaviour has still not reached a consensus, it is valuable to show different perspectives on this matter. With our project we would like to complement something to the already existing information sources about the use of Twitter in politics. Before the digitalisation age, the political discourse used to be tested with surveys. In The Netherlands Maurice de Hond is an important figure in these “polls”, he owns a statistics company that is considered a trustworthy source for prognoses of elections. The company took a lot of telephone surveys to predict the voting behaviour in The Netherlands. Nowadays Maurice de Hond works a lot with the use of Twitter. Twitter makes us able to gather more precise, geolocated information about society. But a pitfall with Twitter is that its users are not a random sample of the population. Only a small part of the world population uses Twitter, while most of them own a working telephone. Twitter had in 2010105,779,710 registered users. What we should take into account is that the top 10% of all Twitter users is responsible for 90% of all tweets. 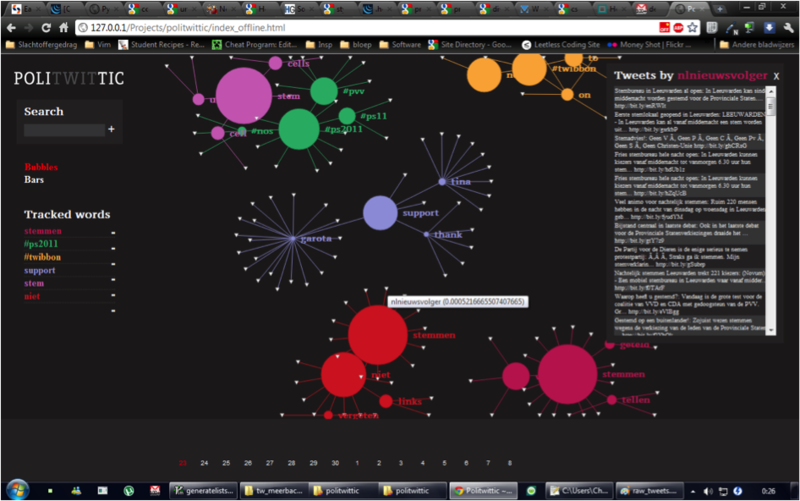 (Heil & Piskorski, 2009) This means that 90% of the tweets are not independent from each other. This structure could be interesting to investigate and/or show in visualization. If these percentages were true we would expect to see a one-to-many structure instead of a peer-to-peer structure. “Politwittic” is an information visualization of the 2011 Provincial State Elections in The Netherlands. The technical aspects and context of our project will be described in the next chapter. The election took place on the 2nd of March 2011. Turnout was 56%, up from 46% in 2007 and was the highest turnout since 1995. A reason for this increase in voters emergence could be the fact that the outcome has major implications. In the 2010 national elections the VVD turned out to be the biggest party in the 2nd board. They choose the CDA and PVV to form a majority and govern the country (a right wing coalition). The provincial state elections determine (indirectly) the 1st board of The Netherlands. It would be extremely difficult for the coalition to govern if they do not achieve a majority in the 1st board. The second board put forward new legislative proposals, and the first board has to approve of these new laws. If the first board has totally different political principles, they might disapprove of every new law and this would not work. The stakes were high for the VVD and their coalition parties in the provincial state election 2011. We already noticed a lot of tweets about this subject. Left wing politicians used twitter to encourage people to not vote for one of the coalition parties, so they would not get a majority and might be deposited from the cabinet. The VVD, CDA and PVV insisted that their followers on Twitter should vote for them to keep them in the government. This tension makes Twitter research about this very election extremely interesting. Keep this site posted for a link to the visualization which will be published on the 19th of May 2011.